Rated 5 out of 5 by skeeteroo from more fun than ever I love the addition of games to do the diagnostics. The best part is that I got to play some games I've never seen before and that's tough to do. I play a LOT and I hate when the game goes too fast. This one doesn't disappoint. If you want more bang for your buck, buy this one! Rated 5 out of 5 by Snowview from completely enjoyable Based on completed game. True fantasy, not horror. Distinctive characters. Loved it and will replay. As always, appreciate the M3 alternative. Rated 5 out of 5 by Azrael711 from Packed with games! Loved this game! For me this was a 5 star game and I don't usually comment. If you love puzzles, this one is packed with them. Played most on the hard level but lets you choose easy as well and there is a match option on the HO's as well. Very linear so not a lot of back and forth. I'm a Fantasy fan and don't mind the deep colors. I think it adds to the genre. Lots of game play in this one. Rated 4 out of 5 by peacelilly47 from love the new diagnostic good addition to the series. just looking at the cut scenes make me happy. Rated 4 out of 5 by Majestyx12 from They Changed the Diagnostic They changed the Diagnostic to a scepter. You don't get to choose where to look for disease. It chooses and you have to do a mini-game for every part. Lung, puzzle, eye puzzle, you get the idea. It's good if you love mini-games but not so much if your a hops lover. I liked the hops well enough and the story. Especially the cat hops. I don't like fool with it puzzles. It has 5 chapters and 13 hops. I think it ended well. This is the 4th in the series and the first two have a extra chapter. Domini also makes these series-Mystery Tales, Dark Romance, Labyrinths of the World and Secret City. Rated 4 out of 5 by biscuitsmama from CAN YOU STOP GROMOSS AND SAVE THE EMPIRE AGAIN? Honored Healer, grab your new and improved diagnostic kit and face off with Gromoss whose petrified body was brought to the royal palace at the command of the Empress Patricia Tar-Liss. Gromoss who is a powerful demon has only one goal in mind and that is to obliterate the human race. After Gromoss is freed from his prison the Empress realizes that her actions were foolish and that she should have listened to Dr. Klein, the head of the Medico Imperium. Fortunately, you are immune to the dark magic that Gromoss wields and you must find a way to stop him and put an end to his diabolical plans. I find myself asking if this series will ever end because I am so tired of the graphics that are drenched in dark blue and purple. If this series continues I hope the developer considers changing the color palette and bringing more light into the darkness of the series. On the good side is that there are some very creative HOPs and those alone make the game worth playing or, at least getting through the demo. There is a good variety in the full HOPS and then there are those mini scenes where you need to find only a few items to proceed. Of course if you don’t want to bother with the HOPS then you can switch to a matching 3 type game. Another great thing from this developer is that they offer a either an easy or a hard setting for most of their puzzles. There are more puzzles than HOPs in the game, another result of gamers clamoring for more puzzles. At least for me, although I love the puzzles I do prefer HOPS which are what got me involved with the genre eons ago. 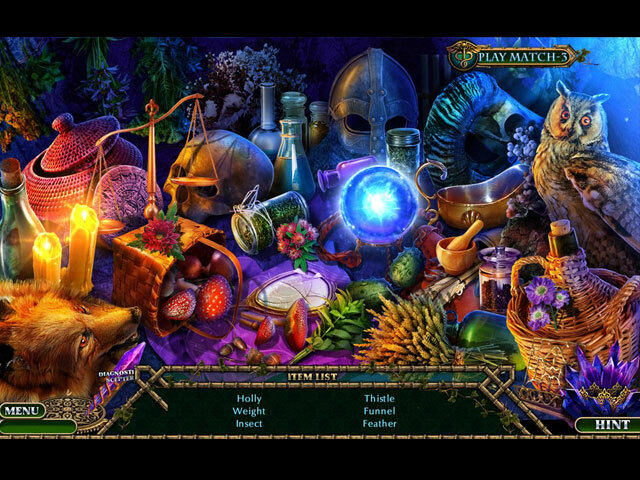 A signature of this series is that playing as the Honored Healer for the Medico Impirium you will have a healer’s kit that will allow you to concoct cures for your patients. Something new in this game is that you now have a fancy scepter that does the diagnostic for you but you still have the fun of mixing the medicine to heal your patient. Even though I am not overly fond of the color palette used in the game, I still love this series and did manage to ignore those intense, dark colors in most scenes. The gameplay is excellent since I happen to love mixing potions and playing doctor. The storyline in many respects is the same as in other games in the series but in the past several years, this is the case with most of the games we are offered here at BFG – endless series with replace the characters and tweak the storyline and voila you have another cookie cutter game. That being said, I still happen to love HOPA games and even though Fiend of Darkness isn’t a stellar game, the developer creates excellent HOPS and Puzzles for my entertainment. Even though I think this is a very good game, as always please try the demo to see if this is a game you will enjoy. Happy gaming! Rated 4 out of 5 by skullfun from ~~DOMINO DELIVERS A DECENT 4TH EDITION TO THIS SERIES.~~ A petrified dragon named Gromoss has been found and Patricia, Empress of the Tar-Liss empire, wanted it displayed at her palace immediately despite Dr. Klein's warnings. Unbeknownst to her, this dragon has a long and complicated relationship with the realm of humans and is now back for his revenge! As an honored healer of the Imperium Medico, can you find a way to tame this vengeful dragon and save the Tar-Liss kingdom? It's another winning achievement for these seasoned developers at Domino, especially given how long it takes to complete the entire adventure. Depending on your level of experience one can expect 6 - 8 hours of gameplay in this latest edition of Enchanted Kingdom. I am an avid fan of Domino games but in this new sequel, the predictable plot centers around a vengeful dragon and a backstory that dates back centuries. This is certainly not anything that hasn't been touched upon before by the HOPA genre, and it would have helped if Domini had added some unique and creative twists. As it is, every beat and every turn of Enchanted Kingdom: The Fiend of Darkness feel familiar. With regard to gameplay; it also feels too familiar. 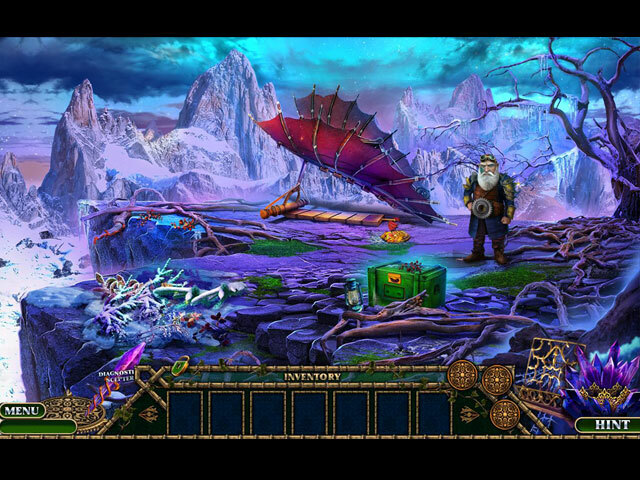 While the overall mechanics of the gameplay are well-constructed, Enchanted Kingdom: The Fiend of Darkness does not give the impression that the developers have put much thought into creating it. 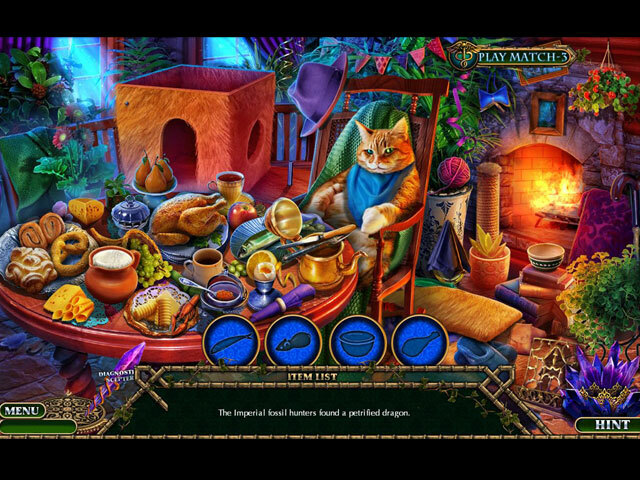 The hidden object scenes could have been more detailed and the puzzles are middle-of-the-road (some puzzles are also mundane IMHO). The adventure aspect of gameplay could be easily completed even if the player isn't totally engaged because this edition could have contained more challenges and brain teasers. That said; the length of this game compensates for the lack of challenging tasks and thinking "outside of the box". It's why I felt this installment was worthy of four stars. Despite a few neat ideas regarding the scene design and some great visual effects, Enchanted Kingdom: The Fiend of Darkness failed to impress me with its artistic visuals. The over-saturation of blue and purple limits the diversity of the scenes which makes it less attractive and other reviewer's have commented on this as well. However, I was really surprised by the quality of the audio. 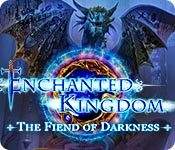 Enchanted Kingdom: The Fiend of Darkness features various non-distracting, magical soundtracks that are not repetitive. The developers efforts with the voice-overs are incredible and wonderfully portray each character which gamers will appreciate during this LONG PLAYING adventure. You really do get your money's worth whether you chose the CE or SE version. I chose the CE version for the bonus chapter during the weekend sale. The Collector’s Edition does not feature anything extraordinary; an unnecessary strategy guide, wallpapers, soundtracks, concept art, re-playable hidden object scenes, re-playable mini-games, achievements, collectibles, morphing objects, and a laboratory. Players may want to use a game coupon for this SE as they expire quickly and if you purchase the CE you may want to wait for the promotional sale. Cheers! Rated 3 out of 5 by cabanaeast18 from no music Good story, graphics. When I play a game for hours, I need the continuity of music to keep interested...not blank air. I know most fishes don't mind, but, for me, to spend money since I have less, I need more to keep playing.